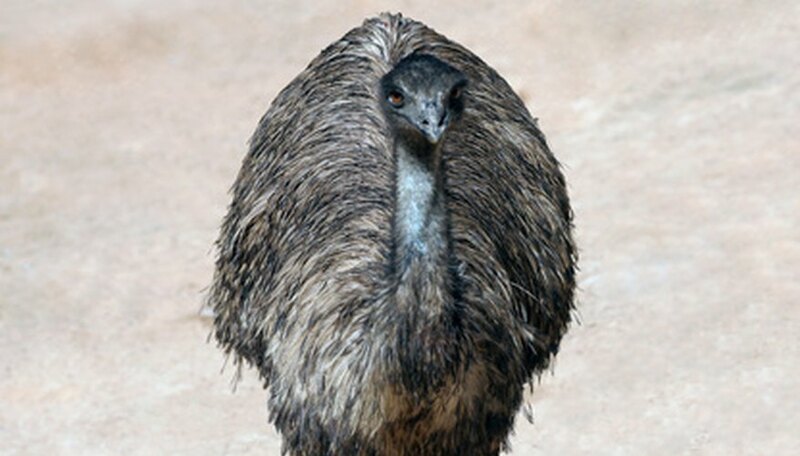 The emu is a large, flightless bird native to Australia. Emu, like all animals, have evolved to suit their environment–in this case, the grasslands and forests of Australia. Over time, they have developed several adaptations which help them survive, including their large size, speed, long necks, sharp beaks, coloring, and a specialized two-eyelid vision adaptation. Measuring between 5 and 6.5 feet (1.5 to 2 meters) tall and weighing up to 130 pounds (60 kilograms), the emu is the second largest bird in the world, after the African ostrich. The emu's large size is an adaptation which helps them overcome their flightlessness, because being larger makes them more difficult for predators to take down. An emu's specialized pelvic muscles are what allow them to run very fast, reaching speeds of up to 30 miles per hour. This speed is another adaptation which helps them escape from predators without flying. Being faster means that it is more difficult for single predators to hunt an emu down. Pack predators, however, have a much easier time outmaneuvering emu. The emu's long neck is an adaptation which allows them to see over even the tallest grasses of the Australian grasslands, allowing them to see predators and other threats from far away. The emu's sharp beak is an adaptation which helps them spear and chew their food. Their diet consists of leaves, grass shoots, larvae and beetles. Their sharp beak is also useful in fending off predators when trapped, and in constructing nests for their mates out of bark, leaves, grass and twigs during the breeding season. The feathers on an emu's body are primarily light brown, an adaptation which allows them to blend in with their grassland environment. In addition, their feathers are light and soft, and move with the wind in the same manner as swaying grass. Because of this, they are able to blend in even more effectively. An emu has two sets of eyelids–one for blinking and lubricating their eyes as humans do, and a second, transparent set of eyelids that keeps dust out of their eyes while they are running at high speeds. This adaptation has evolved so that they could see without damaging their eyes while they are running. Based out of Minneapolis, Minn., Emily Zebrun began writing professionally in 2005. Since then, she has had a short story and five poems published in The College of St. Scholastica's literary magazine, "The Freshwater Review." She is earning a Bachelor of Science in biology at the College of St. Scholastica. What Are the Physical Adaptations of a Koala Bear? Zebrun, Emily. "Adaptations of the Emu." Sciencing, https://sciencing.com/adaptations-emu-6688029.html. 24 April 2017.